Not so long ago, I reviewed the debut issue of Red Sun Magazine. And by darn, if issue two isn't here already. 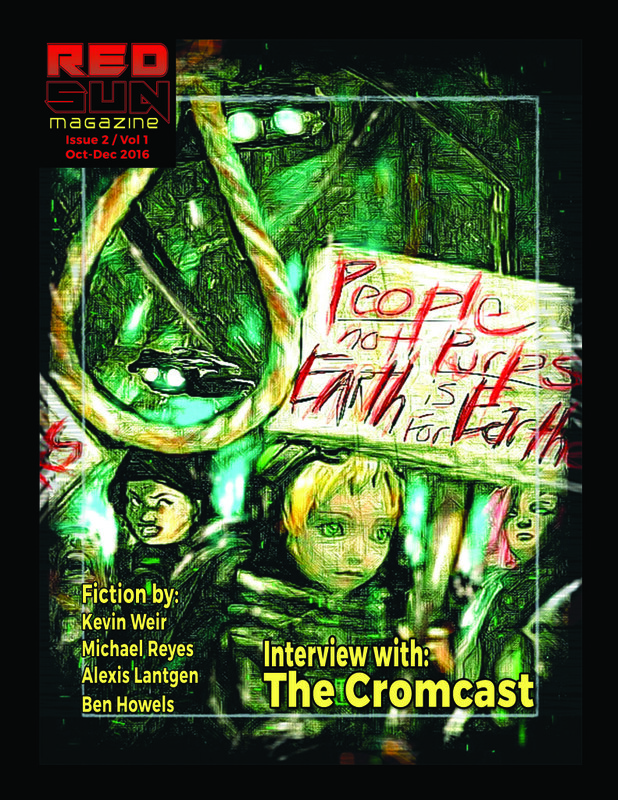 The previous issue was very much focused on military sci fi, while this issue takes more of a tilt at fantasy, starting off with an interview from the team over at the Cromcast. It's a podcast that loves and adores the work of Robert E Howard, creator of Conan, King Kull and many more great tales. Their knowledge and affection shines through - and I can honestly say I'm going to have to go and look up the implausibly titled Pigeons From Hell based on their recommendation. And, with podcast reviewer hat on, add them to my list of shows to feature. Fantasy is also the focus of articles by Judith Field and Karen M Smith, the latter taking a particularly interesting look at fantasy without magic and the implications of such a world. It's a fine line to thread between that and historical fiction, but Smith proves a thoughtful writer, and it's an interesting approach to take. 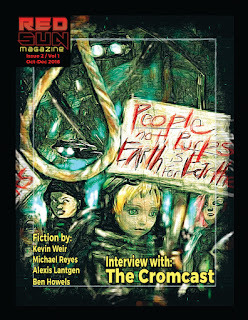 For many, though, the big reason to grab the magazine will be the short stories it features - and this issue includes tales by Michael Reyes, Alexis Lantgen, Ben Howels and Kevin Weir. The Phonebooth, by Reyes, is a descent into madness, as crackly voices over a phonebooth warn deadbeat ex-con Romero not to trust mobile phones, because they are "spreading the infection". What is real and what is only in Romero's head blur as he tumbles through a world where things no longer make sense to him, and towards a nightmarish conclusion. The next story up is a corker - Earth Is For Earthers, by Lantgen, is a belter of a tale about intolerance. Humans living on Utopia who were forced to modify their own genes to survive return to a very unwelcome home, where their changed appearance is enough reason for their fellow humans to distrust them. This is a really superb story, and heartbreaking with it, as two star-crossed lovers get caught up in a sea of bitter prejudice. Howels' story Body of Evidence is more squarely fantasy, with a trial for murder being interrupted by the arrival of the local arbiter, and his pet shapeshifter trog. Neatly written, the balance of power shifts abruptly through the story as the truth begins to out. Kevin Weir rounds out the collection with his tale Sanguinary, with a modern day magician packing a spell in one fist and a shotgun in the other. It gets bloody. Weir also has an interview featured here, in which he chats about his other work and his inspirations. This is a really professionally packaged publication - and now down to $1.99. For that price, you can't fall off. It's a great new addition to the ranks of science fiction and fantasy magazines.